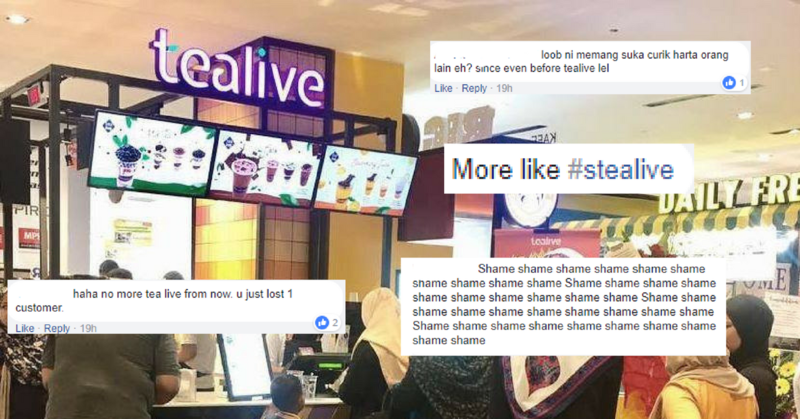 Facebook user Nabila Jalil posted a statement regarding Tealive using her tagline without proper permission. Tealive responded, but it soured many netizen opinions of the brand because it seemed insincere as if they were making excuses. Instead, Tealive should have acknowledged the mistake and vowed to do better. Perhaps one of the most controversial bubble tea brands operating in Malaysia today, scandal strikes again for Tealive. This time, it involves the use of a tagline without—in some opinions—proper credit. 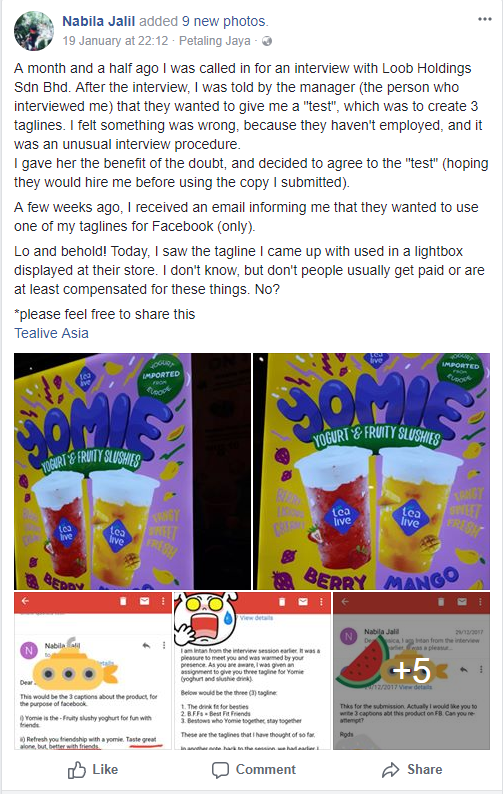 As a quick summary, on the 19th of January 2018, Facebook user Nabila Jalil uploaded a series of texts with a statement alleging that Tealive used a tagline she created without proper compensation. According to the post, she sent in those taglines as part of her interview process for a job at Loob Holding. Tealive reportedly contacted her for permission to use said tagline in a Facebook post only (with credit), but Nabila was surprised to discover that a slightly tweaked version was being used in a store’s lightbox display. Screenshot of Nabila Jalil’s post. Do check out the actual post for screenshots of both email and WhatsApp correspondences between Nabila and a Tealive manager. Netizens are now irate on her behalf. As it so happens, Nabila’s tale resonated because it’s a problem faced by the creative industry—when corporations use their designs, photography, ideas and hard work without compensation. The netizen outrage began to mount. Replies and posts went up calling out Tealive for what is deemed unscrupulous tactics. The inevitable boycott intentions began rising. There are also calls for Nabila to seek monetary reparations for her troubles. So Tealive issued a statement and an apology. As a statement, it seemed to be trying to get a lot done. It was an apology, an update, and also an attempt to reach out to Nabila. However, it seems to be doing more harm than good; more netizens expressed their disappointment and desire to boycott the brand. This common corporate apology was the wrong thing to say in the situation—yet it is the type of apology most often given by corporations in negatively charged situations like this. Bryan Loo, the CEO of Loob Holding, has informed us that he contacted Nabila on Saturday via WhatsApp and Facebook Messenger to apologise personally. He also left a comment on her post on Sunday. However he has yet to receive a response from her. This has been verified via screenshots shown to us. And here’s what Tealive did wrong in its public statement. This is a grave too many corporations dig for themselves: apologising for how someone feels, rather than what they did. 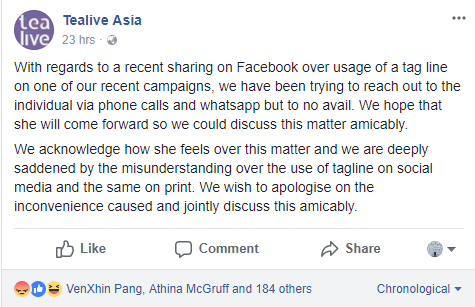 In their statement, Tealive used statements such as “we acknowledge how she feels about the matter” and “we wish to apologise for the inconvenience caused”. Meanwhile, Tealive did not technically admit any guilt—as if their actions would have been alright if Nabila was not “inconvenienced” or didn’t feel bad. This may not be what they meant, but the wording used makes it come across that way. Saying sorry for making someone feel bad is important, but without the crucial next step—reflection on the actions that caused the “bad” feelings—the apology comes across as both incomplete and insincere. Tealive also called the issue a “misunderstanding”, which was another red flag—another excuse. An apology is not the time to go into any detail regarding the incident. In expressing that they are trying to reach Nabila and her not replying, Tealive was seen as pointing fingers at her. Tealive actually opened a can of worms with this; netizens in the comments are pointing out that Tealive should not have used the tagline at all if they couldn’t contact Nabila. Some are also questioning the “misunderstanding” bit. An apology should focus solely on the wrongdoing, and the fact that they are unable to reach Nabila should not have preempted the actual apology. 3. Not owning the mistake. Companies tend to get this wrong too. They’ll say “sorry” in the apology, without addressing it to the actual situation. As mentioned, Tealive apologised because Nabila felt upset, not for what they did. It’s not perfect, and may not express what Tealive was trying to, but it proves that they understand who was affected, and what they did wrong. 4. No clear steps on how they would fix it for the future. They spoke about how they want to reach an amicable agreement with Nabila. But nowhere in the statement did Tealive mention how they would ensure this doesn’t happen in the future. This should come at the tail end of the apology. Express that this will never happen again, and punctuate it with steps on how they would avoid it. So what could they have done instead? So rather than the way it did go up, Tealive should have focused the initial paragraph on their own guilt and remorse: explaining the situation and outlining exactly what could have been done better, and how they will change in the future. Then, they could have still ended the post expressing their desire to connect with Nabila and to make things right. They would still be getting haters at this juncture, but their apology and seeking reparations would have seemed much more sincere rather than just a corporate backpedaling. And it would still have said the same thing they intended to. They can follow the tried and tested method of making a second follow-up apology that acknowledges the mistakes of the first, and does better. Also, it would probably bode well for them to take clear steps to resolving this. For an example of what we thought was a stellar corporate apology, you can check out the open letter written by the new CEO Dara Khosrowshahi, apologising to Londoners after Transport for London decided to ban Uber’s operations there. He avoids all of the pitfalls mentioned earlier, and manages to come across as genuine and contrite, which the beleaguered giant really needs in its current struggles. Some companies (like Nando’s) has an established crisis management team that activates when scandal strikes. When you are corporation that relies on public image, this is crucial in ensuring that you can react fast, and react correctly. After all a bad reaction is worse than a slow one. Many companies may not be too keen about taking blame, but in the long run this would actually benefit the company—as long as they outline how to ensure this never happens again, and actually stick to it. This way, any mistakes can be seen as exactly that—a mistake—instead of an irreparable problem with how the company is run. And in a crisis, that is the best that you can hope for.